Stephanie Barber's feature film, DAREDEVILS, premiers on Oct 3 at "Views from the Avant Garde" in NYC. More about the movie. can i offer you some cabbage? okay, can i have it? oh, that’s what you meant. a phantom limb, phantom feature. havoc. See more from Dr. Pine-Rumelhart in the Pink Line Project and in Apartment Poetry Qtrly. Meg Ronan works as a shopgirl at Bridge Street Books in DC. 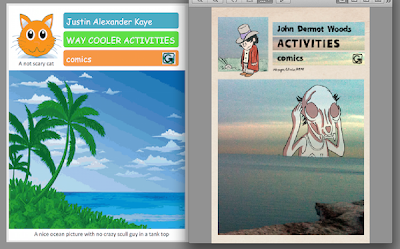 Justin Alexander Kaye put together a blistering review of John Dermot Woods's comic book, Activities. Kaye's scathing attack matches Woods's form, but—he argues—does it much better. Justin Alexander Kaye lives in Washington, DC. Matthew Zingg’s work appears in Cider Press Review, The Madison Review, Low Log, and Opium Magazine, among others. He received his MFA in poetry from Adelphi University. He runs the Federal Dust reading series in Baltimore. were forty years ago. Older skin has its up sides. your crown and whispering, "Easy, easy, easy." Please don't go," and then maybe that person won't. I mean, when a person is not touching me, I miss them. look at my face and tell me how it makes you feel. secrets and we are in the hard center of our lives. their creepiness reaching me on the spot, even now. in-between theirs. They would think, "How rude,"
and when the neighbors talk we pretend not to hear. when I think of you, you are sitting at a desk. Sarah Jean Alexander edits Parlor, an online magazine for exquisite corpse poetry. She is the poetry editor of Shabby Doll House and has work published at Hobart, Spork, Pangur Ban Party, Thought Catalog, Pop Serial, Keep This Bag Away From Children and HOUSEFIRE. Sarah Jean lives in Brooklyn with her orange cat. Like do you still think of America as an experiment? But I would have said porch light was one word: porchlight. I still haven’t learned it. I still want to think the eternal porchlight. Because things being the same as other, dissimilar things pleases me. We watched the sun set. We were on the beach and we watched the sunset. Friend sadly, kindly pointed out, the sign for the Crab Trap. Amy McDaniel lives in Atlanta with her dog, Annette. Her stories, poems, and essays have appeared in Tin House, PANK, The Agriculture Reader, Saveur, H_NGM_N, and elsewhere. Selected Adult Lessons, her chapbook, came out in 2010 from Agnes Fox Press and promptly sold out. Now she is revising a novel about cheese, wine, and coincidences. in rain longer than anyone. a collapse I doubt into. the end of a green light? for red to calm down. laying in the wheeling night. the static do its nothing. blood to be immortal by now. everything to get at height. its brain will run out. to attach to now as was then. It nifty to think. So. a spoon and never do. of the dark and dogs. or a glitter to sue. & liable to skillet dew. After objects, I’m showered out. a mend out of it. Brian Foley is the author of The Constitution (forthcoming from Black Ocean, 2014). Tony Mancus is the author of three chapbooks – Bye Land, Bye Sea, and Diplomancy. He co-founded Flying Guillotine Press with Sommer Browning in 2008. He works as a quality assurance specialist and lives with his wife Shannon and their two yappy cats. Angela Stubbs lives in Los Angeles and is an MFA graduate of the Jack Kerouac School at Naropa University. Her work has appeared in or is forthcoming from Sleepingfish, Black Warrior Review, Bombay Gin, esque Magazine, elimae, Puerto del Sol, The Nervous Breakdown, Not Enough Night, Marco Polo Quarterly, Lambda Literary, DIAGRAM, Astrophil Press, The Collagist, Bookslut and others. She is the author of a fiction column at The Nervous Breakdown and recently completed a collection of hybrid fiction entitled, Try To Remain Hidden and is at work on a collection of poetry. Kyle Flak is from Grand Rapids, Michigan. He won the Chris Toll Prize in 2014 for WHAT HANK SAID ON THE BUS, a manuscript from which these poems appear. His recent volumes of poetry include The Secret Admirer (Adastra Press, 2010) and Harmonica Days (New Sins Press, 2009). His writing has appeared in Mudfish, Poetry East, Spinning Jenny, Whiskey Island and various other literary magazines. He went to school at Northern Michigan University and the University of Massachusetts. Currently, he works at a library. Guy Benjamin Brookshire was born in Arkansas in 1977, got covered in fire ants in 1980 and has since traveled widely. He studied poetry at The Writing Seminars at Johns Hopkins. He is the father of two girls and writes and collages in Vallejo, California. He has completed his first novel: VACATION.